This is the season of cantaloupe and I cannot say enough good things about it. One large wedge has 69% of your daily value of Vitamin A. It also includes potassium, magnesium, vitamin B-6, and it is full of water. Given how hot it is – this is a great fruit to be eating right now. I like my cantaloupe for breakfast, snack, and wrapped in prosciutto as an appetizer. You don’t have to do anything to it! Just cut it open, scoop out the seeds, and eat it. This is even easier than my grilled peaches recipe and I didn’t think I could make things any easier. This breakfast is one of my very favorites and it is fantastic because you only have to wash your spoon. Your bowl is biodegradable, compostable, and you were going to toss it out anyway. 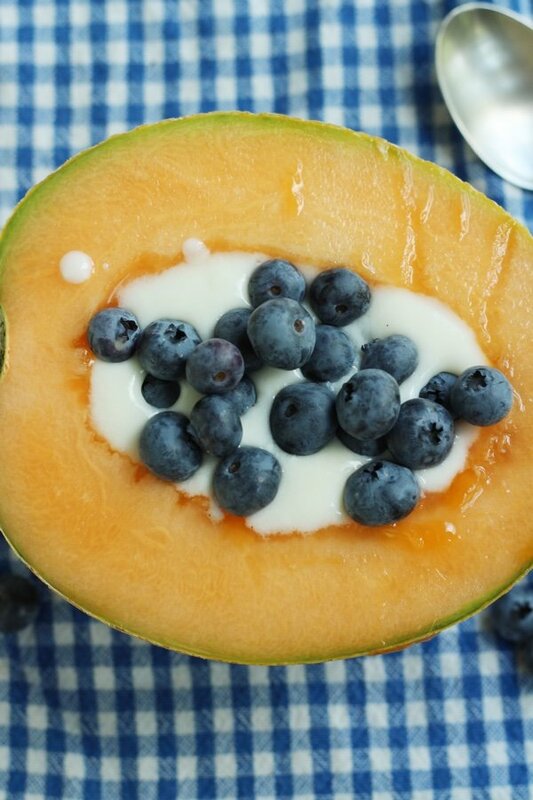 You simply take plain yogurt and blueberries and toss them into the well of the cantaloupe. DONE! Can you call this fast food? I think so. What is so funny is that actual fast food isn’t as fast as this. If you are a Weight Watchers member and you use 0% fat Greek yogurt, this breakfast is a big fat ZERO Freestyle points. ZERO. This is a great way to start the day so you have less to worry about as you cruise along. Obviously, this is just a base for adding other things you might like such as granola, nuts, seeds (or a little honey if your cantaloupe turns out to be not ripe enough). If you don’t like cantaloupe (WHAT? ), you can use honeydew melon. Funny thing about cantaloupe. No matter when I try to eat it, cut up or what, I get a good stomachache. I can eat other melons with no problem. But cantaloupe sends me to bed. Can’t figure out why. It’s not acidic, not too sweet. Dunno. I love cantaloupe too. The only problem for me is trying to find a ripe one. When I was a kid we'd fill the center with vanilla ice cream (not as healthy of course but it was really good). There's a wonderful new coconut yogurt on the market that would be perfect in this for me so I can't wait to try it. No comment about the pope ☺️. I love cantaloupe and love Pope Francis too :) . I find you very refreshing and thank you for writing without being afraid of being flamed in the comments. If you ever have a chance the best cantaloupe I have ever had is the Yubari King. There was a recipe card in our supermarket here in France for cantaloupe gazpacho that is divine--half an American size cantaloupe (a whole one here, but they are smaller), one each chopped red and yellow bell pepper, and about a half of an English type cucumber. Whir it all up and add a tablespoon of olive oil and two tablespoons of sherry vinegar. Top with chopped cilantro and a couple of berries if you like. It is soooo good! We like a little kick, so we make a topping of piri piri sauce--minced red onion, chopped celery, minced jalapenos, some red pepper flakes if the jalapeno is mild, a little olive oil, and vinegar. It has to be a good sweet cantaloupe, so eat some first, and if it's sweet, make the gazpacho with the other half! Not everyone should eat cantaloupes. I’m in recovery from ovarian cancer. Because the chemo damaged my immune system I have to scrub all fruits and veg. The spongy rind is difficult to be sure it is really clean. Same with honeydew. Watermelon is OK. Thanks for the inspiration! I just cut up my ripe cantaloupe, had it with vanilla yogurt, blueberries and a tablespoon of granola. Yum! I belong to TOPS in Stayner Ontario (pop of about 4,300). Just thought you would like to know we use recipes from Snack Girl and are cheering you on! I love cantaloupe! I'm so glad to hear it's not just sugar and is actually good for you. It makes a great breakfast, snack or even dessert. Now I know what I am having for lunch. I developed an inability to eat eggs. Not allergic to them. My digestive system will no longer digest them. So perhaps the reader who can't eat cantaloupe has a similar issue. Love cantaloupe and Pope Francis is very inspiring. One bite would send me off to emergency room. I am severely allergic to all melons and cucumbers in the raw state. If I cook them they are unappetizing but safe. and there's no problem buying a "bad" one. are my favorites when I need to focus on what goes in my mouth. I did not do as good as expected this summer. ok, any advice on starting back? I have the WW Books etc. Hope to be @ this weeks meeting. Ooohhhh!!! This idea sounded so good i ran to my grocery store today and bought a melon... not sure if it's exactly a cantaloupe -they called it an Athena melon whatever that is but it looks similar to a cantaloupe only larger and not as orangey-yellow... it was good just not as sweet; but I got some yogurt and will pair them with some blueberries and some roasted almonds!!! This will be breakfast tomorrow...cant wait!!!! 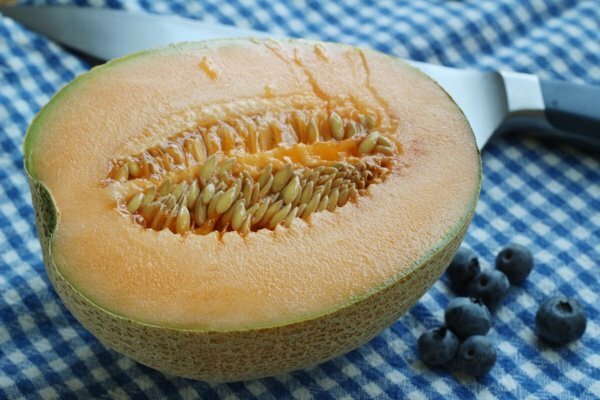 If your cantaloupe isn't ripe enough, a great trick is to sprinkle it worth a tiny amount of salt. It will make it taste much sweeter. Don't do this if you're on a salt restricted diet, of course. The melons here in south Florida are not sweet this year and seem to be very hard,,,like not ripe enough. I have tried it 5 or 6 times. I am going to Trader Joe's today and will try one from there. Thanks for your suggestions as always they are great ideas! Tanks for all you do! 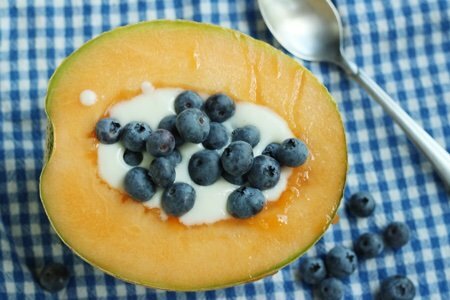 I love cantaloupe with cottage cheese. I eat that even when I'm not actively trying to lose weight. HI, I JUST WANTED TO ADD, MY FATHER-IN LAW INTRODUCED US TO THESE MELONS. SO FOR YEARS WE HAVE BOUGHT "CRENSHAW" MELONS. THEY ARE SWEET, YUM, ORANGE-YELLOWISH INSIDE, GREENISH & YELLOW SKIN OUTSIDE, OVAL SHAPE. ALSO, "THE SANTA CLAUS", IS AWESOME, IT'S SO GOOD, SWEET INSIDE, YELLOW-ORANGE, OUTER SKIN IS GREEN. 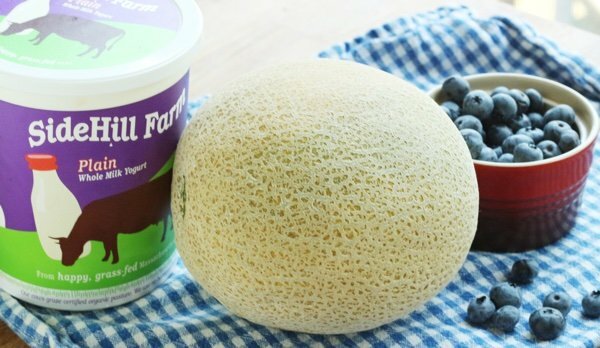 YOU CUT BOTH MELONS THE SAME AS CANTALOUPES. BOTH MELONS INSIDE ARE JUST SSOOOO GOOD! OK, GO ON LINE & SEE ALL THE MELONS. THEY SHOW THE NAME, OUTER SKIN, INSIDE, DESCRIBE WHERE THEY ARE FROM, GREAT INFO. BET YOUR SAW MOST OF THEM. AND NOW YOU KNOW!!! HAVE A BLESSED DAY! Hi Lisa, Haven't been on in a while and just wanted to check in. Love Cantaloupe! Thanks!